Hello, welcome to my 'Enemy Attributes and Spawning Guide' for RE5 Mercenaries. This guide will help you to understand how the spawning system works in RE5 Mercenaries, and allow you to identify all random and scripted plagas in a stage. It will also give insights into why strategies work by explaining how each spawn area within a stage has specific spawn points associated with it, and even allow you to make new strategies. All data presented has been extracted directly from the game by Sectus (big thanks to him), and so it can be considered 'reliable'. So far only a PA guide exists, but I am also working on other maps for which I'll provide map previews. A Missile Area guide is coming next. For now this project has reached a hiatus as I usually only play PA.
Each spawn area within a stage has a specific set of spawn points that are 'associated' with it, which are only activated when the spawn area that they belong to is occupied. These 'spawn points' are very specific points outside of the map's boundaries where enemies are generated (usually you cannot see these spawn points). Each spawn point that is in a unique position (outside of the map) generates it's own unique 'enemy set'. Once an enemy has spawned from an enemy set, it will come into the stage through certain 'entry points'. For the purpose of this guide, they will now be referred to as 'spawn points', as that is what they are most known by. 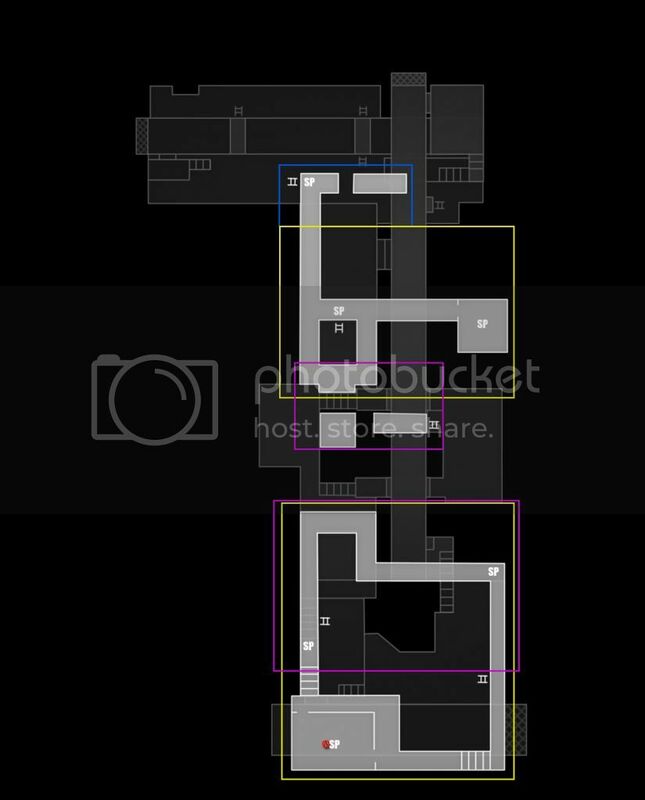 Spawn points can be shared by multiple enemy sets associated with the same spawn area (such as spawn point 7 in the map above), or even enemy sets belonging to more than one spawn area (such as spawn points 3A-3D). In the Public Assembly map shown above, the boundaries of Spawn Area A are in orange, and the boundaries of Spawn Area B are in green. Each spawn point has a colour associated with it, which indicates what spawn area the enemy set (or sets) that comes from it is associated with. As you can see, some spawn points are associated with Area A only, some with Area B only, and some both. Knowing what spawn points are 'active' upon entering a certain spawn area(s) is a vital element in creating a strategy for building as much time as possible. Knowing what enemy sets are 'active' can also prepare you for campers and any scripted plagas. Also note that some enemies are 'regionless', meaning the spawn area that you are in on the map will not affect their spawning on the map (instead, the number of kills that have been made by either player will activate them). The characteristics of a spawn point are defined by the enemy sets that are associated with it, and the enemy set's characteristics are obviously defined by each enemy that comes from it. As you can see, there is a 'dividing line' after the first 5 enemies, which I refer to as a 'tier'. Once all the enemies have spawned from the first tier of this enemy set, only then can the enemies from the second tier be activated. If you were to compare this enemy set to another one, you will see that it is unique. 5 right-handed bottle males are part of the first tier, which are all 'safe'. Once all have spawned, the next tier will be activated; in this tier, some enemies are random cephalos (indicated by an asterisk), and contains a right-handed bottle male, and a mix of right-handed pole and club males. Most of the right-handed bottle males in Public Assembly will come from this set. Spawn sets can have 2 or more 'tiers'. Enemies will randomly spawn from the first tier, then once all the enemies from the first tier are depleted, the next tier will follow in sequence. All the enemies do not have to be killed from the first tier to activate the next one, they just need to spawn. This is why you will only see a female pole majini (the only one in Public Assembly) from A1 after at least 4 females have spawned from there, or why enemies such as molotovs never spawn early on in a game. Generally, the first 'tier' is the 'easiest', and as the subsequent tiers are activated, they become 'harder'. When less than 12 enemies are in a stage, enemies will spawn randomly from all of the currently 'active' spawn sets, which is determined from the spawn areas you or you and your partner are currently occupying. 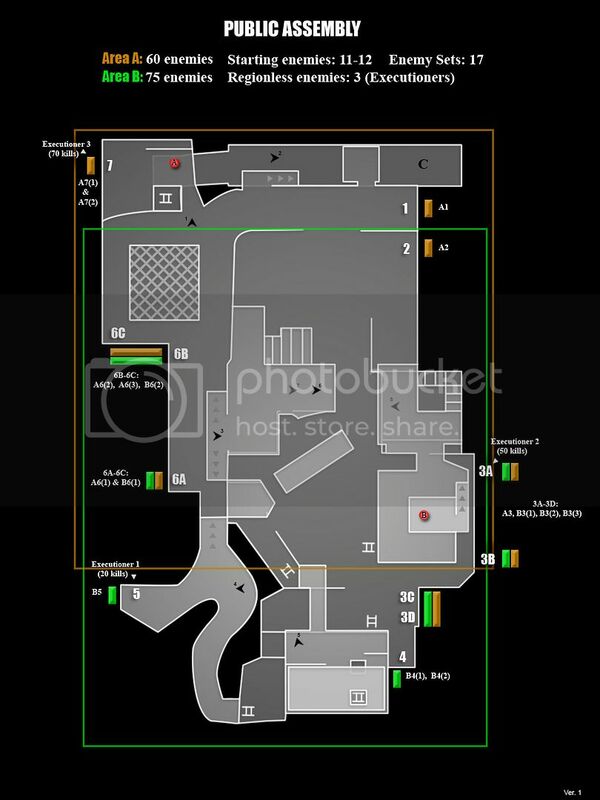 In a duo game, the players can position themselves on the map so that all the spawn areas are occupied at once (with some maps however, it is impossible to occupy all spawn areas at once). Some spawn areas overlap, and so you can still be in more than one spawn area at a time even when playing solo. The more spawn areas you are in, the more spawn sets that are 'active' throughout the map, and the more random the spawning will be. Spawn points that have multiple enemy sets will be the places where enemies spawn most frequently from, such as 6A-6C and 3A-3D in PA. Spawn points that have fewer enemy sets will spawn enemies less frequently. The total amount of enemies that come from each spawn area's associated spawn points will always equal that spawn area's enemy total; however, the total amount of enemies that come from one specific spawn point's enemy set can vary by 0-4, as the distribution between enemy sets will differ each run, meaning certain enemies from a spawn point's enemy set will be 'omitted', including camping, random plagas, and scripted enemies (the total amount of scripted enemies that come from a particular spawn area will always be the same. However, different enemies may be scripted each run). Generally, if there are few spawn areas and a lot of spawn points in a map, the spawning will be much more random and 'dispersed' than maps that have more spawn areas and less/equal spawn points (when less than 12 enemies are in a stage). This is why a stage like Public Assembly will be less 'consistent' in terms of enemy spawning than a map such as Ancient Ruins. Some spawn points can also be 'joint' (as in Public Assembly's 3A-3D spawn points), meaning enemies can choose what spawn point they come through depending on you and your partner's position on the map (you can see these joint spawn points as a 'single' spawn point). Multiple enemy sets associated with different spawn areas can also come from a joint spawn point, including more than one associated with the same area (as in Public Assembly's B3(1), B3(2), and B3(3) sets). Each spawn point or joint spawn points contain different amounts of enemies, some containing a high population, some containing less. To increase your bonus time effectively, you must position yourself in the area of 'best enemy flow', relative to the currently active spawn points; knowing the total population of the spawn points will also affect that positioning. Some spawn areas also have limitations as to how many enemies from that spawn area can be among the stage's 12 enemies, which indicates a spawn area's 'difficulty'. -The number '2' beside an enemy indicates how many weapons it has. -'*' beside an enemy indicates that it is a random cephalo, which can only be activated upon a critical. -'(F)' beside an enemy indicates that it has a fixed appearance. -'(c)' beside an enemy indicates that it is a camper. If it is followed by a number, it refers to a starting camper on the map. There will be 8 campers that start out in PA, as shown in the map. In a duo game, if you start at point B (on top of the platform), you will immediately agitate camper 5 and 6. Camper 4 can be seen in the distance on the hill, and will be facing away from the platform player. It's best for the platform player to agitate him by shooting him, although the other player can also agitate him. After jumping down from the platform and passing the back end of the bus, you will agitate campers 3, 7, and 8. Campers 7 and 8 are both females with a high random cephalo chance, and have a fixed appearance. If you start at point A, you will immediately agitate camper 1. Passing the red and blue umbrella to the left of camper 1 will agitate camper 2, even though he is facing away from you. 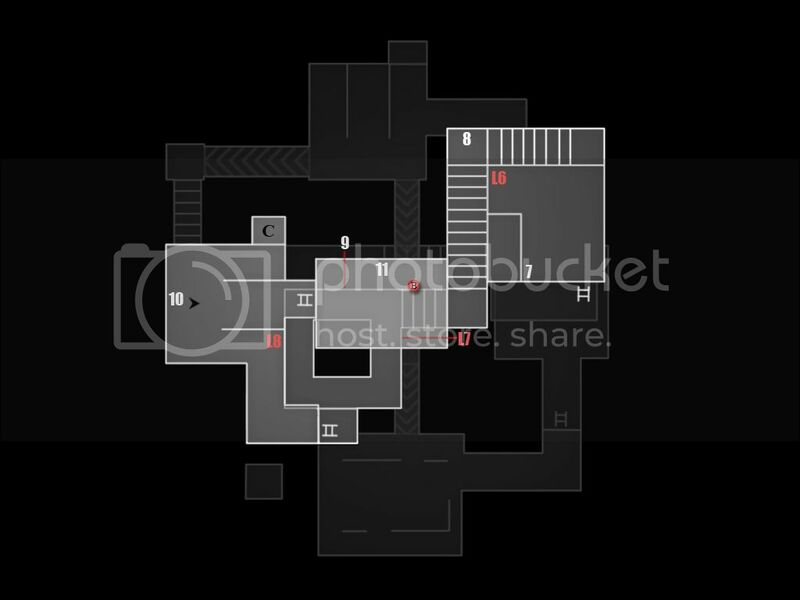 -All enemies are safe, except for the female campers 7 and 8 (that start out inside the houses), which are high chance random cephalos. They have a fixed appearance, and will always look the same each run. -A chicken starts out in the waterway, beside the explosive barrel underneath the small shack containing a 30sec timer. Choosing to shoot that right from the start at point A can kill it. Once agitated, it can run along the whole stretch of the waterway, and in extremely rare instances, it can even make it's way up the ramp and escape. Once a chicken is agitated, it will run for a brief period in the direction it was facing. Agitate it when it's facing the direction you want it to go. It has two random appearances: grey and brown coloured. Grey chickens will lay brown and white eggs, and brown chickens will lay gold, brown, and white eggs. This chicken will always drop a gold egg when killed. This spawn point is associated with Area A only. Only females come from this spawn point, and have a very high random cephalo and critical rate. Doing a head attack on these enemies is extremely risky. This spawn point is the only one to contain left-handed single weapon females. A pole female will also spawn from the second tier of the enemy set, and is the only one in the stage. This spawn point is associated with Area A only. Only right-handed single bottle males will spawn from the first tier of it's enemy set, and they are all safe. This is where the majority of the right-handed single bottle males will come from. -The first 5 right-handed single bottle males are safe. -The only right-handed single club male is safe. -Be cautious of the right-handed single bottle male that spawns after at least 5 right-handed bottle males have appeared, as it is a random cephalo. -Be cautious of right-handed pole males, as 1/3 is a random cephalo. It will spawn after at least 5 right-handed bottle males have appeared. This large joint spawn point is associated with Area A and Area B, with the majority of enemies coming from Area B. 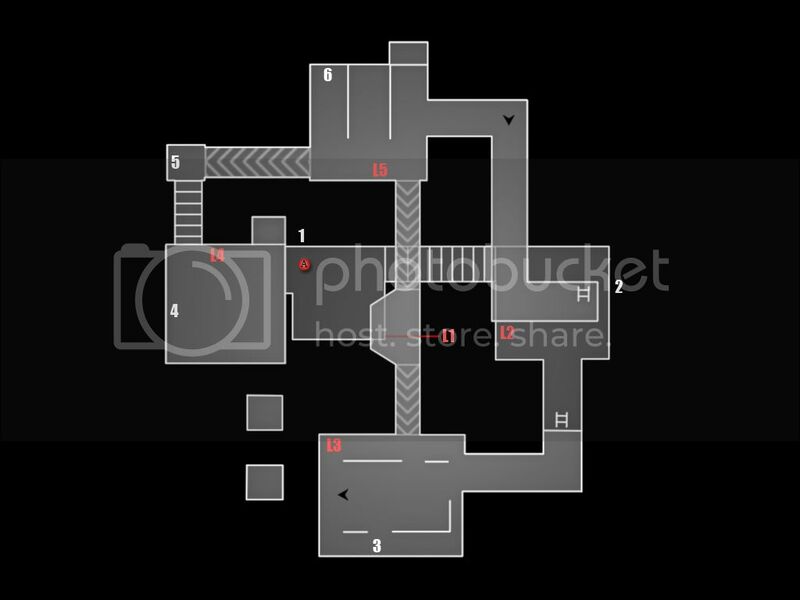 It is the most highly populated spawn point, containing 4 enemy sets (1 from Area A, and 3 from Area B). The enemies can choose what spawn point to drop down from depending on your position on the map, and sometimes you will even see them climbing up on the platform behind the wall at 3A then deciding to jump down again. The 2nd Executioner can even choose to drop down from 3C (above the car) in rare cases. This joint spawn point contains up to 4 molotov males, and is one of the three spawn points that contain them. It is also the only spawn point to contain a random cephalo molotov male. The spawn points above the car (3C and 3D) making ideal throwing locations for molotov enemies. It is also the only spawn point to contain left-handed single axe males, and they are all safe. -All right-handed single machete, sickle, and club males are safe. -All left-handed pole and axe males are safe. -All weaponless males are safe. -Be cautious of right-handed single wrench males, as 1/3 is a random cephalo. It will spawn after at least 5 right-handed machete males have appeared. -Be cautious of right-handed pole males, as 2/6 are random cephalos. These two will only spawn after at least 5 right-handed machete males have appeared. -Be cautious of molotov males, as 1/4 is a random cephalo. It will spawn after at least 5 right-handed machete males have appeared. -Be cautious of the 3rd and 4th right-handed single axe males, as they are random cephalos. -Be cautious of the 2nd right-handed single bottle male, as it is a random cephalo. This spawn point is associated with Area B only. Most of the enemies from this spawn point will have two weapons, except for a few weaponless females. All the males will be right-handed, and the females will only be left-handed (if carrying weapons). It is the only spawn point that has right-handed double weapon males, double weapon females, and weaponless females. 2 enemies are random cephalos, and they are easy to identify: the first right-handed double bottle male, and the second left-handed double sickle female. -All right-handed double weapon males are safe, except for the 1st right-handed double bottle male. -All females are safe, except for the 2nd left-handed double sickle female. This spawn point is associated with Area B only, and contains only a few enemies. It is one of the three spawn points that contain molotov enemies. It is also the only one to contain left-handed double club males, and they are all safe. -All left-handed double club and molotov males are safe. -Be cautious of the 2nd left-handed pole male, as it is a random cephalo. This large joint spawn point is associated with Area A and Area B, with an equal amount of enemies coming from both areas. It is the second largest populated spawn point, after 3A-3D. This joint spawn point contains 2 campers, and they belong to the enemy sets associated with Area A. There are 3 enemies shown to have camping properties in the enemy set listing for A6(2), but only 2/3 will camp. One will camp next to the fire barrels, and one will camp next to the pillars. You will sometimes see a camping right-handed single club male next to the pillars in a different position each run- this is because each have differing camping coordinates, and one got there before the other. It is the only spawn point to contain left-handed single sickle males (which are all safe), left-handed single club males, left-handed double axe and bottle males (which all have a high random cephalo rate), and the only safe right-handed single machete females. -All right-handed single weapon and weaponless enemies are safe, except for the only right-handed single axe male, which is a random cephalo. It will spawn after at least 4 right-handed single club males have appeared. -All left-handed single weapon enemies are safe, except for the second left-handed single club male, which is a random cephalo. -Be cautious of left-handed double bottle and axe males that predominantly spawn from 6A, as they have a high random cephalo rate. They don't have a critical rate as high as the females from Spawn Point 1, but if you do get a critical, a cephalo spawns 80% of the time. Minimize head attacks on these enemies. The enemies from this set can sometimes choose to drop down from 6C and 6B, but rarely. So don't assume that enemies from 6C and 6B are mostly safe- make sure you look to see if another weapon is strapped to the enemy's back if it's a left-handed bottle male. If you see a left-handed axe male drop from 6C or 6B, it will always have another axe strapped to it's back, as there are no other types of left-handed axe males that come from this joint spawn point. -3/4 of the right-handed club males are campers, but only two will camp. This spawn point is associated with Area A only. It is the only one to contain right-handed bottle females, and they are all random cephalos. It is also one out of the three spawn points that contains molotov enemies. One of the first two right-handed single bottle females will be a camper. One of the right-handed pole males is also a camper, and he can vary the most as to when he will appear, as only 1/5 is the camper from A7(1). -All right-handed pole and molotov males are safe. -Be cautious of right-handed single sickle males, as 1/2 is a random cephalo. -Be cautious of right-handed single bottle females, as they are all random cephalos. One of the first two will be a camper. -The right-handed machete female that spawns from 6A-6C. -The weaponless and right-handed double axe females that spawn from 4. The second left-handed double sickle female that spawns from 4 is a random cephalo however, so take caution with it. Spawn point 4 is the only place where double weapon and weaponless female spawn. "-3/4 of the right-handed club males are campers, but only two will camp." This sounds pretty weird to me. 3 of them are campers but only 2 of them really camp - doesn't that make it 2 campers then? 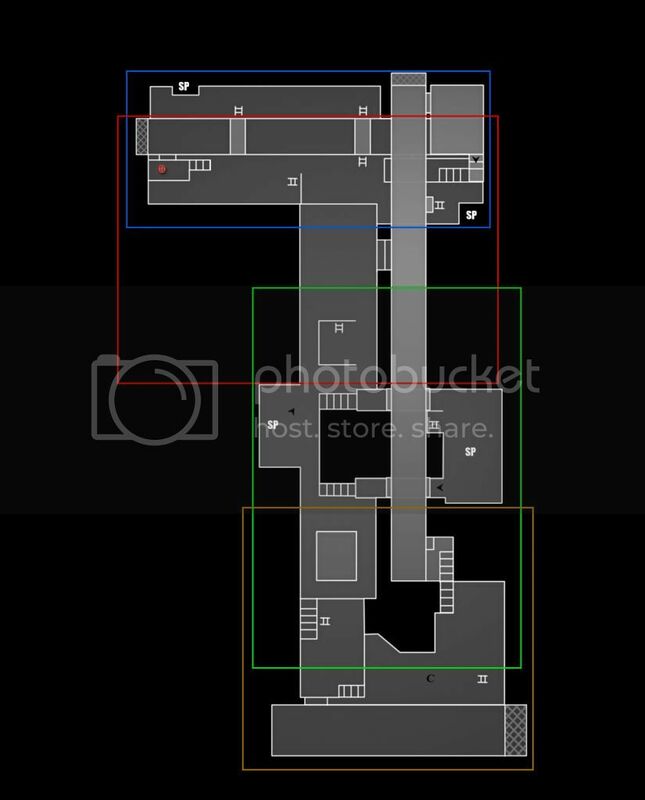 However, Sectus' data shows that 3 out of the 4 right-handed club males have camping properties (not 2) from A6(2), and this is significant because it means that the enemies are much more likely to camp there early on than the campers from spawn point 7, as more than 2 have the potential to do so. Once one has camped next to the pillars, the other one is not allowed to go there- but you may sometimes see him walk up to that point, then decide to follow you. I would say that the data is accurate from observing this behaviour. I thought it was worth mentioning that there was an extra potential camper because there is a 3/4 chance that the 1st right-handed club male from SP 6 will camp and not a 2/4 chance. I will read most of this, great job and it is already matching up with the stuff i know by playing the game. will read more and please do all maps even though im pretty sure i already know most of all the random ceph stuff by playing the game too damn much, still really curious about the exact details of things like spawning patterns, regions etc. edit: there is so much more information here... too bad a normal web forum isn't the best place to organize it. Hello all, I've recently made some changes to my PA guide, and fixed a few errors. I'm sorry to those who use this guide, as it's had some pretty bad errors that have resulted in quite a few cephalos during my runs. tier 2 and only one RM female in tier 1. From my experience there's more than 1 RM female from here so I checked the data and it showed that 3 females come from A6(1) and not 1 female and 2 males. -Fixed the enemy listing from B5, I was missing a LP male in tier 1. I also said that the 1st LP male is a random but it's in fact the 2nd one. I noticed the later one became a random so I checked the data and saw the mistake. -Edited the chicken paragraph from the 'Spawn Point Analysis' of the starting set. -Fixed A2. The left-handed bottle male from tier 2 is meant to be a right-handed bottle male. I noticed that I was getting a lot of right-handed bottle male cephalos from the back alley, which at first I thought came from the platform area. I checked the data and it showed A2 had no left-handed bottle males, and that I mistakenly labelled the right-handed bottle male random cephalo as left-handed. Like I've said in the introduction, progress has been slow on this guide, as I pretty much only play PA. Once I reach my goals there in solo and duo then I'll continue the rest of the guide. "My goal on Duo is to reach 1050k then I will play other stages with you, Chris."